Litigation Solutions Inc., Colorado is pleased to announce the hiring of Erin Perczak. Perczak is the Companys new Manager of Electronic Production. He rejoined the LSI team in early August 2013. He had worked with the firm up until 2010. Michael Lopez, President of LSI, Colorado said, Were all very excited to have Erin back here at LSI. He worked with us a few years ago. Were aware of his extensive skills and breath of knowledge. Undoubtedly, Erin is going to help us develop and expand our hosted review capabilities and support our expansion of internal technology resources. Perczaks work involves electronically stored Information data collection and litigation matters management. He is also involved in attorney and client collaboration. At LSI he has taken on an eDiscovery-consulting role for law firms and corporate council. This consulting used to be completed in house, but now theyve expanded externally, helping to support multiple law firms. In an interview Perczak said, Im thrilled about the opportunity I have at LSI to help the Company expand and grow, as well as enhance our ability to explore new technologies. Perczak is proficient in the ITRO suite of products as well as Axcelerate, Summation and numerous online document review forms. He is also certified in LexisNexis LAW PreDiscover and Concordance. Prior to joining LSI in 2013, Perczak was with the firm Faegre Baker Daniels where he was a Litigation Support Analyst in the Client Technical Solutions group. Perczak said, The experience I gained at Faegre Baker Daniels equipped me to excel at my position at LSI. I had previously worked with the team here, so when the opportunity arose to come back, I was very excited. Perczak went on to say that the work he did previously and that he will do at LSI is very similar, with the privilege of increased responsibilities at LSI. He also added, Returning to work with people Ive worked closely with before is a real bonus. It is a bonus for LSI that Perczak is an active member in his profession. He sits on the board of directors at Colorado Association of Litigation Support Professionals and he is in the International Legal Technology Association. If you or your firm is looking for professional litigation support, technological or otherwise, contact Litigation Solutions Inc. today at Litigation Solutions Inc., Colorado. 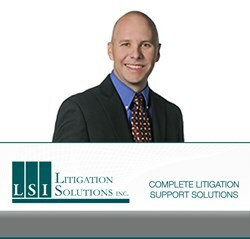 About: (LSI) is a full-service litigation support company, offering a complete range of solutions by a professional staff. Whatever stage your case may be in discovery, trial, meditation LSI has the experience and tools to help you succeed. Low-tech or high-tech, LSI is fully equipped to deliver the right solution at the right time. With over 10 years in the industry, LSI can meet and exceed your requirements at every stage in the life of your case. We solve problems by matching the appropriate technology. That means we are positioned to provide solutions for all needs, with accuracy, speed and quality. LSI has traditionally catered to the litigation attorney and law firm, but our services also translate to the corporate client. For the CFO, LSI can help control litigation costs. It is estimated that 70%-80% of a litigation cases cost is in the discovery and review phases, areas that LSI can impact the most. At LSI, we strive to exceed our clients expectations and needs by doing everything we can to get the job done. Right. On Time. The First Time.